Our young visitors enjoying London and the sunshine on a magical trip to Hampton Court Palace! Summer is in full swing and more and more young visitors are discovering London with London Magical Tours. Here Madeline and Anne (in the above photo) took a fascinating trip to the Royal Palace of King Henry VIII and even had a chance to greet him in person! Hampton Court Palace is also known for its splendid outside garden maze which kids and adults alike can enjoy in the summer months, along with their beautiful gardens. To discover all that the Royal Palace of Hampton Court has to offer, book your trip with London Magical Tours. We plan day trips exclusively for you and your family to make the most of your summer! giras Londres Español, London activities, London Family Tours, London for Children, London Guide for Children, London Information, London Private Tour, London Tours Children, Private London Tours, VIP London Tours, What to do London. permalink. Thank your for your message, we will be delighted to assist. 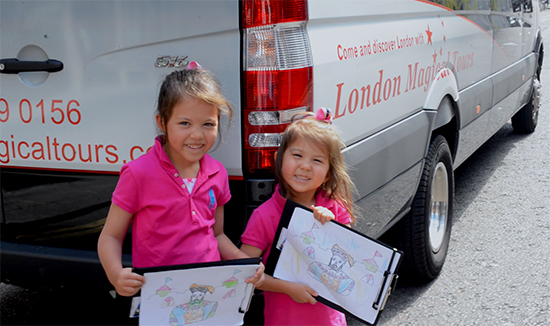 We have specialist guides for families visiting with children to help make their London experience both educational and fun. The London Magical Tours 24hr Internet Department have replied back to you, we very much look forward to being of service. If we can be of any further assistance please do not hesitate to e-mail info@londonmagicaltours.com for more information.